Cake balls have been popular for quite a while now, although I never tried them until recently. Living Social had All in One Bake Shop (AIOBS) classes for $22 again a while back. I loved my previous cookie class and knew I had to grab the deal. 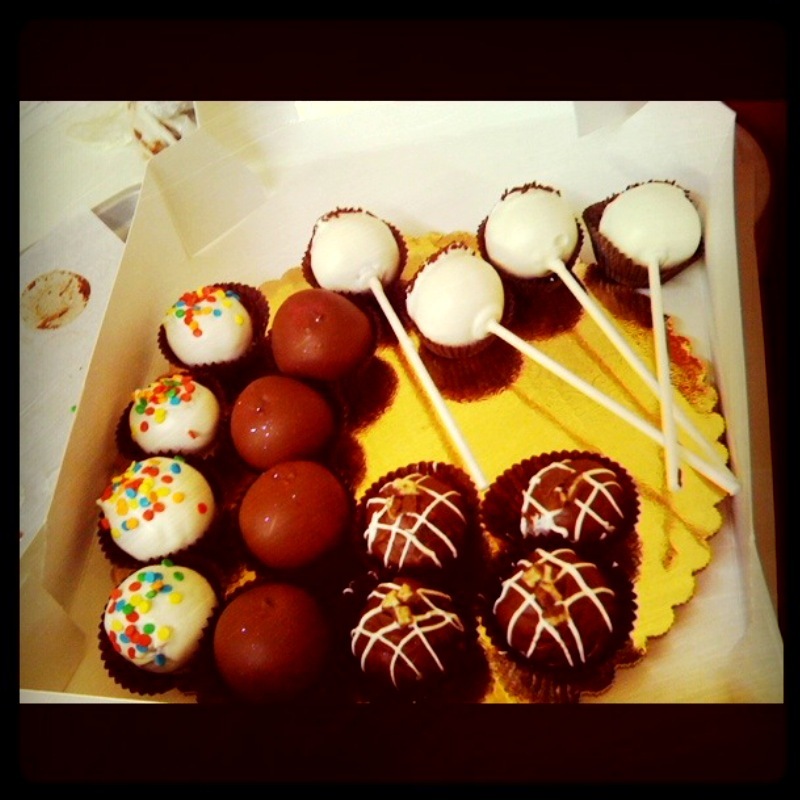 My friend, Claire, and I took the cake balls class with Jennifer this past Monday. Cake Mix: Similar to the cookie class, they had prepared the cake and icing mix in advance. They provided four kinds of batter: red velvet cake, confetti cake, mixed berry cake, and chocolate mint cake. The full instructions on their cake mix are available here. Cream butter and cream cheese until fluffy and smooth using the paddle attachment of a stand mixer. Slowly add powdered sugar and mix on low speed until fully incorporated. Add vanilla and mix on high until smooth. Store in the refrigerator, up to 3 days. Before using, bring icing to room temperature, and beat on the lowest speed with the paddle attachment until smooth, about 5 minutes. Cakes with cream cheese icing should be stored in the refrigerator. Place sugar and egg whites in a metal bowl over a double boiler. Whisk until sugar has dissolved and egg whites are hot to the touch, about 3 minutes. Test the mixture by rubbing it between your fingers; it should feel smooth with no grains of sugar. Transfer mixture to bowl of a stand. Using the whisk attachment, beat on high speed until mixture has cooled completely and formed stiff and glossy peaks, about 10 minutes. Switch to the paddle attachment, and beat on the lowest speed to eliminate any air pockets. about 5 minutes. Store in the refrigerator, up to 3 days. Before using, bring buttercream to room temperature, and beat on the lowest speed with the paddle attachment until smooth, about 5 minutes. Buttercream cakes should be refrigerated. A 10 inch cake (2 inches tall) will make about 18-24 cake balls. Crumble cake pieces and allow to dry out for 1-2 hours. Place cake pieces in large bowl and mix in icing by hand (1/4 cup for 10 inch cake; add more/less icing as desired—more tastes doughy, less tastes cakey). Continue folding together so there are no dry parts. 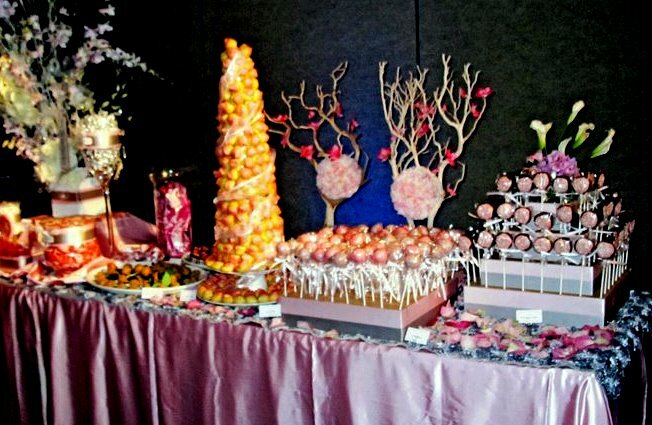 Check consistency and then add confetti, chocolate, icing fruit, liqueur syrup, etc. if you’d like. Press plastic wrap tightly on mixture and refrigerate for 2 hours to overnight. Use a tablespoon to scoop out even sized portions of dough. Roll into balls using cupped hands and place on parchment lined sheet pan. Check that there are no cracks in the ball and the dough is the consistency you want when you break it in half. Dip the balls while they are cool room temperature after you have rolled them. 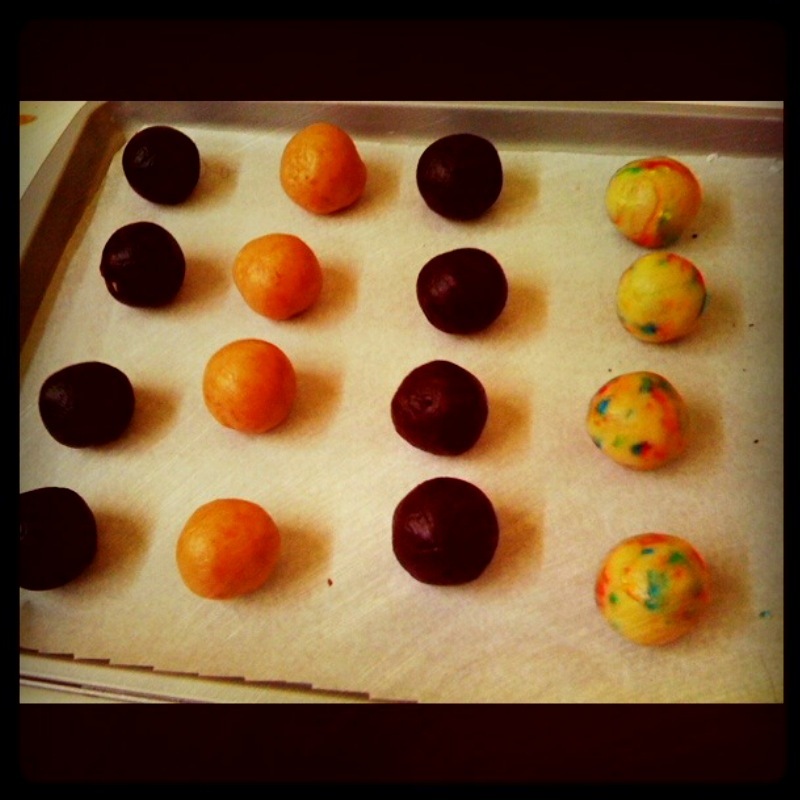 Note: refrigerating the rolled balls and then dipping will cause the chocolate to crack. Melt candy coating: Use a melting chocolate from a known chocolate-making brand like Guittard, Ghirardelli, Hershey, etc. Place chocolate coating disks into a microwave-safe plastic bowl. Heat for 1 minute and stir. Heat for 30 seconds and stir and repeat until fully melted. Pour the melted chocolate into a smaller microwaveable container, deep enough so that the ball can be submerged all the way into the chocolate. White chocolate was used for the red velvet and confetti cake balls; dark chocolate for the mixed berry and chocolate mint balls. Using a toothpick – stab the top of the ball with a toothpick. use the toothpick as a handle and dip into the chocolate. Pull out of the chocolate and gently swirl to drip off excess chocolate. Place on parchment lined cookie sheet and gently shake to release the ball. Top immediately with a little extra chocolate to cover the hole. 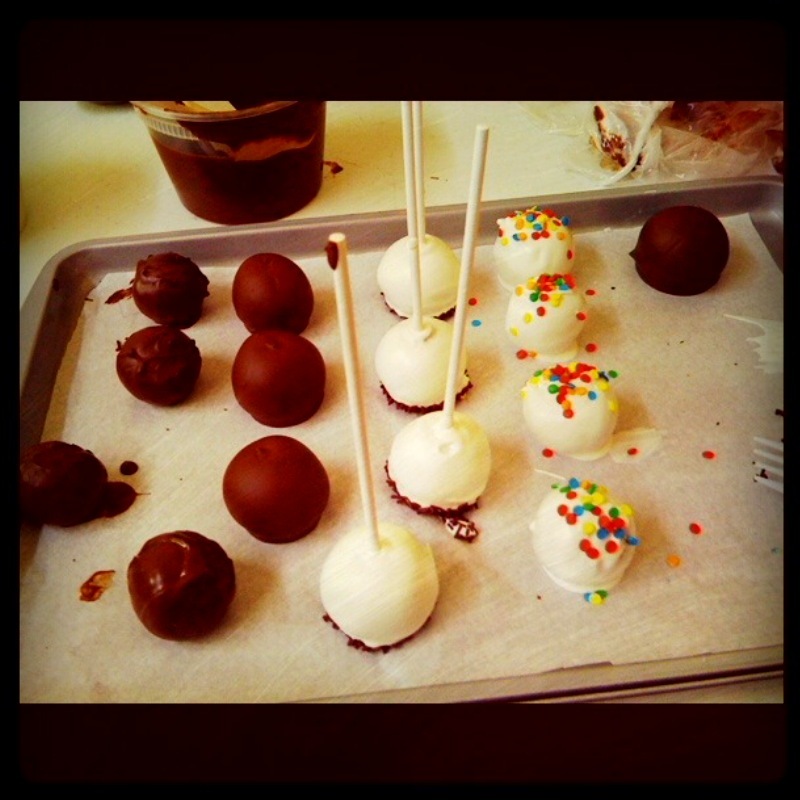 For cake ball pops – Dip the end of a lollipop or cookie stick into the melted chocolate and then stab it into the cake ball, all the way to the sheet. Allow the chocolate on the stick to stiffen. Dip the whole ball into the chocolate, gently swirl to drip off excess chocolate. Place on parchment lined cookie sheet or styrofoam block. Optional: allow chocolate to stiffen for 30 seconds and dip into sprinkles, confetti, etc. to hide flat top. Drizzle coordinating colors of chocolate on top. Top with sprinkles/confetti/crunches/chopped nuts before the chocolate has set. Sprinkle disco dust after chocolate has set. 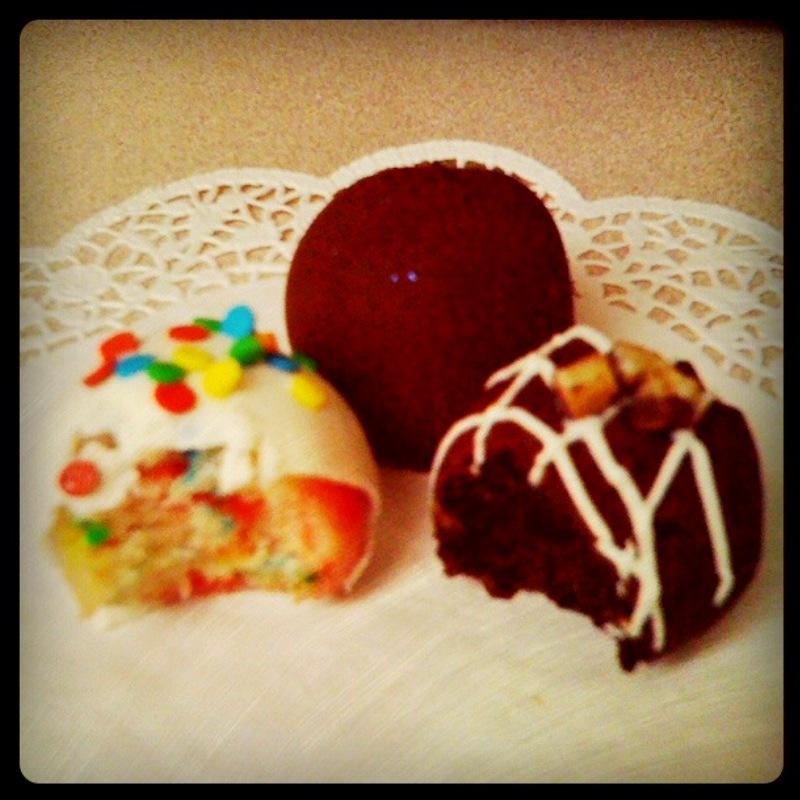 Cake balls will last 3-4 days at room temperature and two weeks if refrigerated. Refrigerate the balls inside a box to reduce condensation. Serve chilled or at room temperature. C-Man liked the chocolate mint the best, while I thought they were all a bit too sweet (disclaimer: I don’t like most cakes because they’re too sweet). But these were so fun to make! I may try them for the next Princemas party, but hopefully they won’t be as troublesome as those darned Prince symbol cookies. Try using a premade cake, maybe pound cake? Use store-bought brownies or donut holes instead of rolling cake balls. This entry was posted in Food and tagged Cake Balls. Bookmark the permalink.